Musk oxen are large and incredible creatures that survive in the brutal conditions of the arctic tundra. 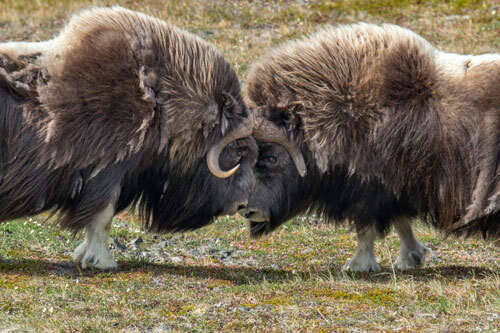 These mammals are often compared to cattle such as the very furry highland cow, yet musk ox are actually related more closely to sheep and goats. Musk oxen are part of the Bovidae family (all of the species of this family have two-toed hooves, four-chambered stomachs, and are herbivores). Here are some more cool facts about the amazing mammals, the musk ox! Distribution/Location: The musk ox lives in the arctic tundra regions of North America and Greenland. Although the musk ox was wiped out of Europe and Alaska due to over-hunting, they have been successfully reintroduced since then. Distribution of musk oxen in North America. It is especially amazing that the musk ox spends all year above the northern tree line of the Arctic tundra because it is one of the most brutal environments. 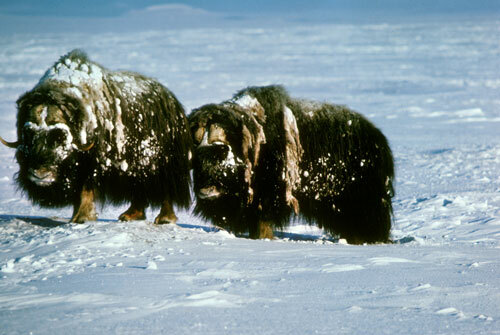 Due to the harsh climate and the isolation that musk oxen face in the arctic tundra, they are at risk of diseases. The herds must always adapt and find new ways to survive. Appearance: It is no surprise that a musk ox is a VERY large animal! They have a large shoulder hump and a bulky build. These mammals average at about 1.2 meters tall and between 1.9 and 2.3 meters in length. The males weigh anywhere between 200kg and 400kg whereas females weigh between 150kg and 200kg. So male musk oxen tend to be much larger than the females. Musk ox have short and curling horns on each side of their head. The horns of the males form a brow band that crosses the front of its forehead. Musk ox are dark brown or black. They have long, coarse outer hair which makes them look a bit like a buffalo but they are actually more similar to sheep. Under these guard hairs is qiviut. Qiviut is short fine wool that is used by people to knit or weave the softest and warmest natural woolen material available. Having multiple layers of hair and wool allows the musk ox to stay insulated in the cold Arctic weather. Diet: Musk ox are herbivores—eating grass, willows, seeds and berries. In order to find food in the winters, musk oxen will dig into the snow with their hooves and noses. The musk ox find nutrients easily during the summer months—when they can enjoy tasty grasses and seasonal wild flowers. However, during the winter they must depend on roots, mosses, and lichen that grow on the hillides where the snow layer is much thinner. As a result, nutrients is much harder to come by in the winter months. 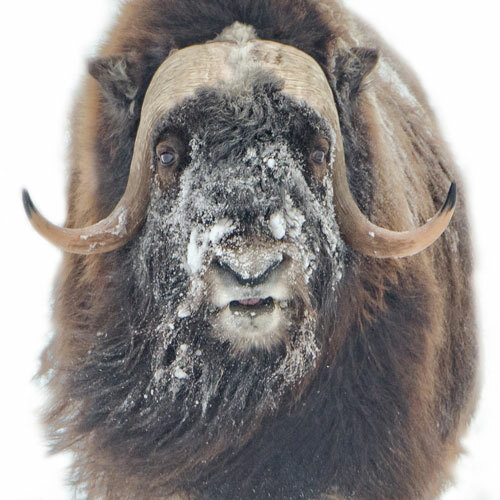 Musk oxen depend on their ability to develop a thick layer of body-fat throughout the spring and summer in order to prepare for the harsh winter season. Habitat: The arctic tundra is a very challenging environment to survive in, and it requires a lot of adaptation. Musk oxen don't travel any lower than the treeline of the arctic tundra, which is quite amazing because not many animals can survive in such harsh conditions. 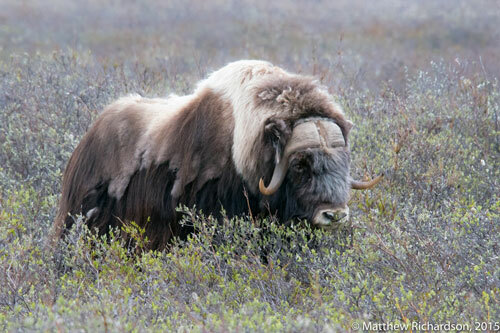 In the summer months musk oxen take up residence in the wetlands, rivers, and valleys in the lower elevations of the arctic tundra. There is more access to food in the lower elevations, which is great for developing a thick layer of body-fat/insulation in preperation for the winter months. In the winter they actually move up to higher elevations where the snow is easier to move through. Their thick fur, insulated bodies, and heavy hooves help to keep these resilliant animals warm! Mating: Males compete for the right to breed with the females by strutting, swinging their heads and ultimately charging into one another head-on. These confrontations are referred to as "ruts". On impact, the brow bands of the horns of each male collide with the other making a loud, distinctive, hollow noise that can be heard for over a kilometer. 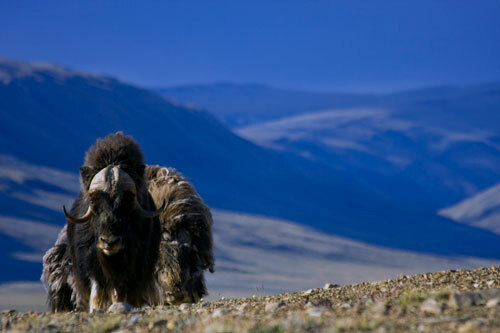 During the charge toward each other the male muskox can reach speeds of about 50 km per hour, and they may repeat the charge as many as a dozen times before one of them gives up and runs away. The winning male will impregnate all of the females in its herd of about 6 to 12 animals. Breeding: After mating in the fall, the females remain pregnant through the winter, for 8 to 9 months, giving birth to a single calf in the spring. Twins are possible, but very rare. Each female gives birth to a calf every year or two. Seasonal Behavior: During the summer months musk ox herds tend to be very small with as little as 5 animals that are usually part of a family. However, due to the especially harsh conditions of the winter months, musk oxen will create groups much larger. Having up to 70 musk oxen in a herd can help protect the animals against the weather and predators. 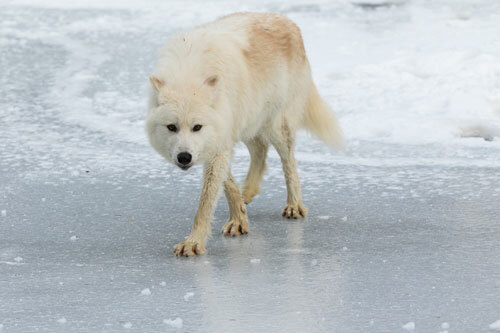 Predators: Wolves and bears are their only predators (although humans have hunted them in the past). In a large enough herd, musk oxen defend themselves by forming a circle around their young. Both males and females face their heads outward, ready to stab at predators with their horns by tossing their heads. Smaller herds form a line or semi-circle with all adults facing the threat. The closest related animal of the musk ox can be found in the Eastern Humalayas! It is called a Takin and it is a goat-antelope. The Inuit name for the musk ox is umingmak, meaning “the bearded one”. A musk ox that is being raised on a farm produces enough qiviut to spin 100 to 150 meters of wool each year. 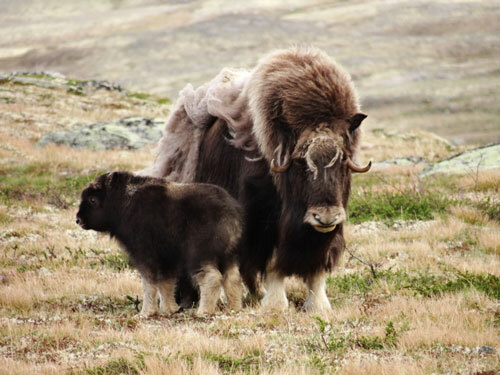 Female musk oxen reach maturity at about 2 years old where as males don't reach maturity until they are 5! The fur of the musk ox is very long! The thick outer coat can reach nearly 100cm in length, which is one of the longest of any animal. The musk ox is named after the strong, musky smell that they release during mating season even though the smell isn't actually musk!